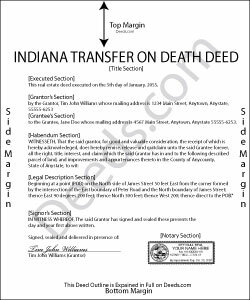 Indiana outlines the rules for its transfer on death deed in I.C. 32-17-14 -- the "Transfer on Death Property Act." Indiana transfer on death deeds transfer ownership rights of real property to a predetermined beneficiary after the owner's death. This enables Indiana residents to pass their real estate to their heirs outside of probate. The owners keep full control over the property during their lives -- the conveyance only occurs after the owners die -- so they may sell, rent or use the land as they wish. They may change the designated beneficiary or cancel the entire transfer by simply executing a revocation that redefines their wishes. Note that this is only valid when it is executed (signed) and recorded WHILE THE OWNER IS STILL ALIVE. If not, the deed is void and the property passes through probate with the rest of the owner's estate. These conveyances might also have an impact on taxes and eligibility for healthcare programs. Carefully review all aspects of estate planning when considering a transfer on death deed.